HEARTBAND MUG: As with any number of very worthwhile patterns for carnival glass collectors, we list this very dainty little mug which is virtually never available, and when one does appear on the scene, few buyers take notice. The only example which sold for more than five years of recorded prices, only brought $30. No doubt that buyer had a penchant for the unusual! What a BUY! Heartband mugs are found in two sizes and in green and marigold colors. 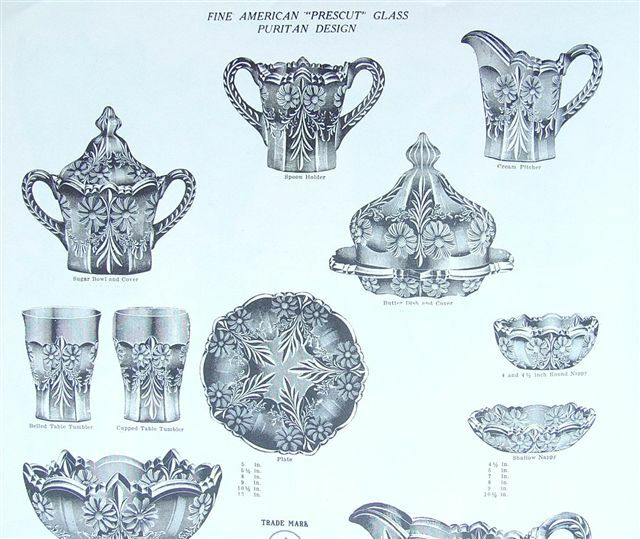 Occasionally a sugar or creamer or tumbler can be found having souvenir printing. The real shame of it all, is that hoopla and recognition is bestowed upon the dozens of examples in patterns which are well-known and frequently available by reason that so few collectors are actually interested in purchasing anything “out of the norm”. Most spend little time becoming familiar with information of knowledge and history, but rather depend upon the word of mouth recommendation of sellers. You can readily recognize the assimilation of this statement. Sellers and buyers have need of exchange in what is at hand. The unusual escapes its “just dues”. We have found that only those collectors who “collect for the long-haul”, delve into the depths of understanding required for appreciation of such “non-descript” scarcities as a Heartband Mug. HEARTBAND OPEN SUGAR: This piece does not appear on the market very often, so we feel pleased to be able to include it in this segment. Feb. 1911 Butler Bros. Ad showing the Heartband pattern. 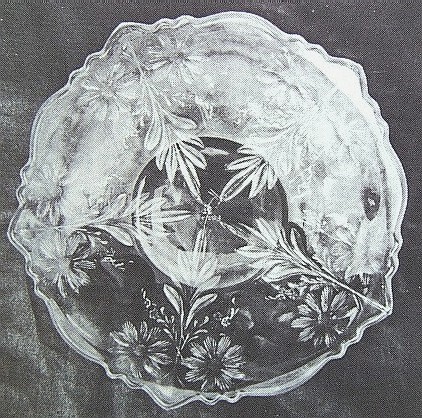 PURITAN: This is a marigold 6” plate in the Puritan pattern. Puritan is the original McKee Factory name for this pattern. Their McKee PRES CUT trademark is found on the inside center of the plate. The Britts found this little plate, already familiar with the pattern, for they also owned a beautiful ruby stain tumbler in the same pattern. 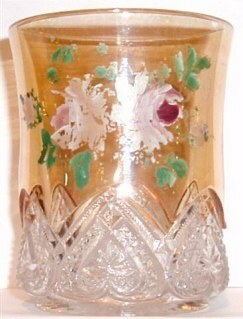 While McKee was a very large producer of pattern glass, they made very little iridized carnival glass. The most often found pattern having iridescence is the Heart Band pattern. NOTE: The 4” round nappy shown in the ad taken from the COMPLETE BOOK of MCKEE, pictured just to the right of the PURITAN plate was found by the Britts in cobalt blue-iridized. It is 1 ½” high. These pieces are marked with the PRES CUT trademark. Ad taken from the McKee Book verifies the pattern and displays the design quite adequately. 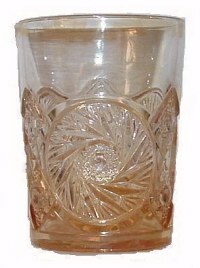 SUNBEAM Whiskey Glass in marigold-verified by John & Lucile Britt. 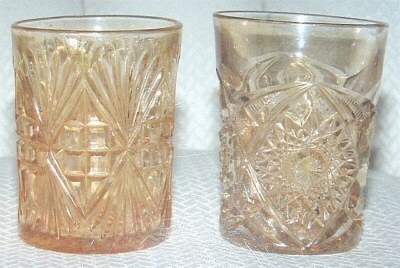 SUNBEAM Whiskey Glass: McKee began making pressed glass in 1853, but are not known to have made much iridescent Carnival Glass. 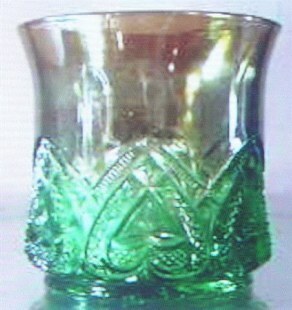 Some of their glass carry their famous trade mark “PRESCUT”. Pieces in the Heartband pattern are seen more often than any others. 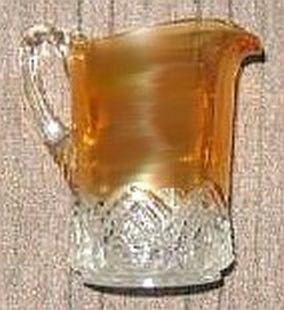 The marigold Sunbeam whiskey glass shown here is about the same size as the Northwood Grape and Cable whiskey glasses, standing 2 7/8” high with a top opening of 2 ¼”. The base is 1 ¾” in diameter and contains a 12 point star on the bottom. Sitting beside an Imperial toothpick holder, this glass is scarcely ½” taller. UPDATE - All the above are McKee moulds - (Faux) in Marigold. 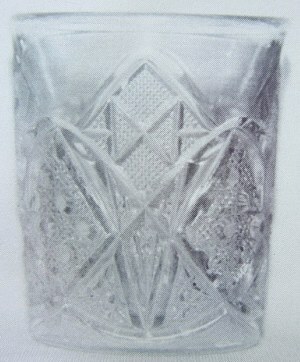 These tumblers are now known to have been created by Marlin Springs in Waco, Texas. 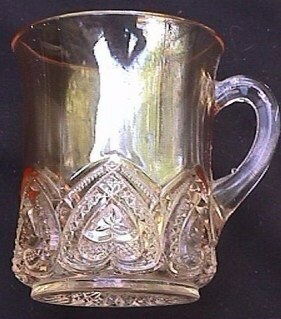 AZTEC pattern is known in marigold Carnival Glass, including a few rare tumblers and water pitcher. MARTEC tumblers are known in marigold, along with a MAJESTIC marigold tumbler. 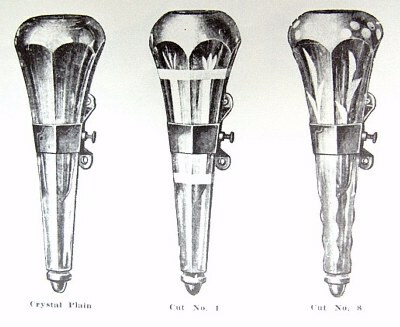 Examples of these were discovered in the mid -1980s. Wines, goblets and a cordial are known in the CUBA pattern in marigold Carnival. RAINBOW is another juice size tumbler that is known in Carnival Glass. 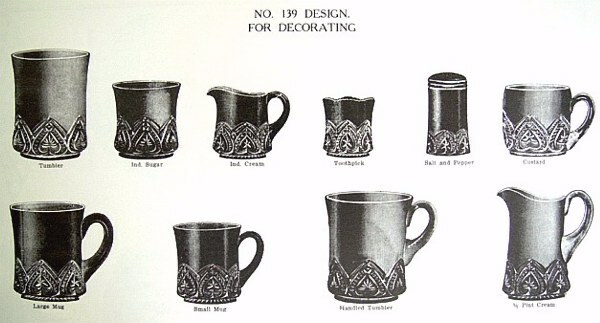 All of these patterns can be found in “The Complete Book on McKee Glass” by Sandra McPhee Stout. This is a large book containing hundreds of McKee patterns and the very interesting history of that company. 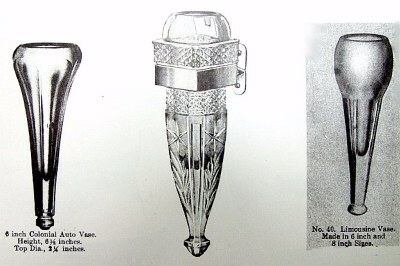 LIMOUSINE or CAR Vases: The ads displayed in the COMPLETE BOOK on McKEE clearly indicate the intended use of these vases. We can vouch for having seen the bracket inside a 1932 Nash Sedan, and a 1920 Ford Model T.
One more interesting aspect for their use was as gravesite flower holders. The points on the bottom of these vases would most certainly have been capable of penetrating the ground without much effort. 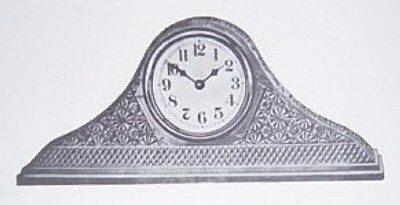 TAMBOUR CLOCK in marigold: We have seen one of these for sale over Ebay during the past couple of years. It was quite pretty! They must be very scarce! 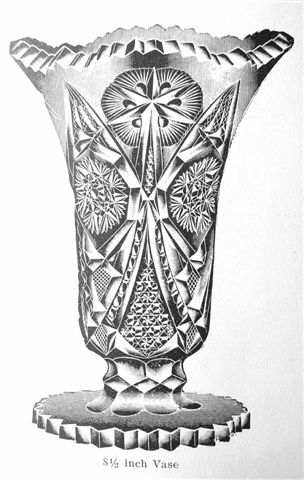 In taking a serious look at the vase taken from the COMPLETE BOOK OF MCKEE, we submit the possibility that the Honeycomb and Hobstar vase which has always been attributed to Millersburg, could quite conceivably have come from a McKee mold. 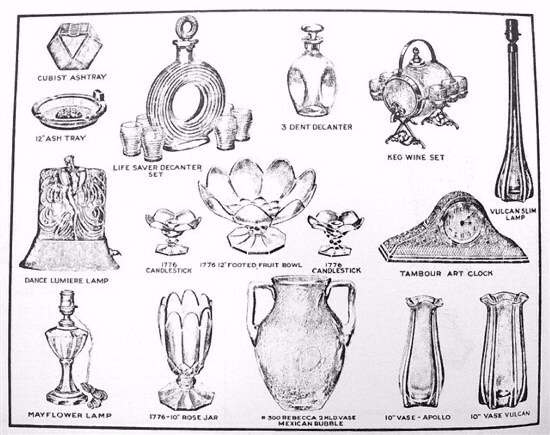 In studying various overall shapes and the bases of several manufacturers' vases, we conclude that McKee is a reasonable producer. The virtual obscurity of the Honeycomb and Hobstar examples provides further evidence to that conclusion.